I was invited for a wonderful lunch today at Pierre by my new friend Francois Mauss. Since Mr Gagnaire is actually in town this week, I was definitely not going to turn down this invitation! Honestly, Francois is such a gentlemen and I am grateful for his generosity. We started with a bottle of generic Bourgogne from the 2005 vintage - forgot to check the producer. The wine was rich and ripe, very explosive with minerals, reasonably sweet in the mouth. For a generic Bourgogne (not even a village wine) I thought it was pretty excellent. The amuse bouche was quite interesting. It was a parfait/pate made of strips of braised beef brisket (牛腩), carrot and turnip - just like the Chinese dish! Very interesting way to start the meal. The first course was the oyster. From the bottom it was oysters out of the shell, sprinkled with tiny cubes of pear and tofu, topped with a paper-thin layer of agar, with a scoop of oyster cream, then strips of Japanese nori and sprinkles of a rich, seafood-flavored powder. Sounds complicated and there were many ingredients, but the amazing thing is that the one taste that came through immediately was the oyster. It was complimented by the nori (tasting also of the sea) and the orange seafood powder. The slightly sweet-tasting agar and pear provided a nice balance in the overall structure. The second course was an avocado guacamole, except that it was blended with cumin and Indian spices so that it tasted of curry. It was paired with lobster cream on the side, which actually worked reasonably well together. What followed was a very wonderful dish. Thin loops of calamari was topped with basmati rice, long strips of vegetable (zucchini?) and topped with lobster bisque. The combination of the lobster bisque and calamari was perfect, and the long-grained basmati rice also provided good texture in the mouth. The sommelier chose a bottle of 2004 Frederic Magnien Gevrey Chambertin Vielles Vignes. Initially the wine was all sweet fruit, very forward and just the new style that I like. Gradually the wine softened a bit and the structure, complexity and acidity came out, making it more balanced and classic. Finish was a bit short but hey, it's only a village wine after all. Finally we were served some very, very delicious lamb chops. There was so much fat on these babies, and the flavors just exploded in my mouth. They were also incredibly juicy and tender. If you're not a fan of the "lamby" taste, then these definitely weren't your thing. I was very tempted to pick the bones up with my hands and strip them of any remaining bits of meat and tendons, as I have been known to do. But...I choose to behave myself so as not to embarrass my host. In typical Pierre fashion, we were served two sets of desserts - each with three variations. The first set came with a parfait of red peppers, raspberry and lemon. There was also a compote of red peppers with white chocolate, and a glass of strawberry compote. The second set delivered a samosa with lychee cream, along with a bowl of delicious vanilla cream. Desserts have always been one of the highlights of a meal at Pierre, and I was duly reminded of this today. The sommelier also poured us a glass of Jurancon to go with the desserts. Throughout the meal, we were graced with the presence of Mr Gagnaire as he came to say hello to Francois. 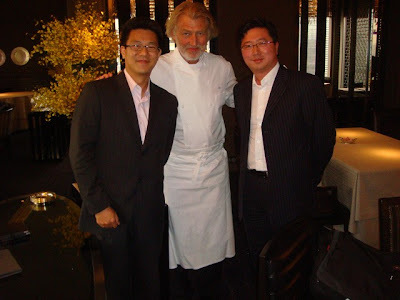 Mr Gagnaire commented that it was more difficult to source top-quality ingredients in Hong Kong compared to Tokyo, but he was proud to have shipped in around 300 lobsters on this visit. At the end of the very long lunch, we excused ourselves and headed off to Vinexpo so that Francois could properly conduct his interview with Mr Gagnaire. It was a really wonderful meal, and I look forward to returning the favor in the near future. Try again if you are in HK. 17 oct 2008 Pierre is in his restaurant and have started a new menu from this week. Almost perfect tasting experience gauranteed.